Now that Summer is in full swing, we’re moving away from the deciduous into the Black/Red Pine work. 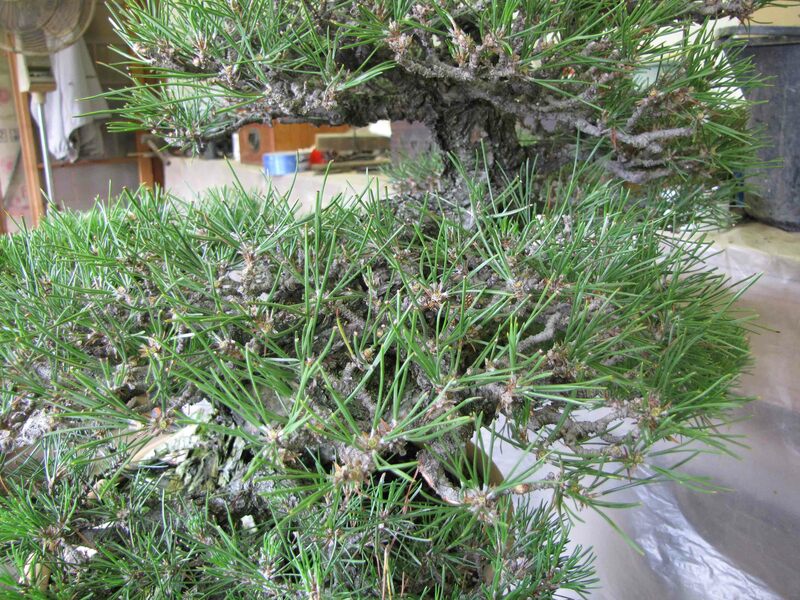 During the Summer is the time we start to de-candle the many Black/Red Pines we have here at Aichien. 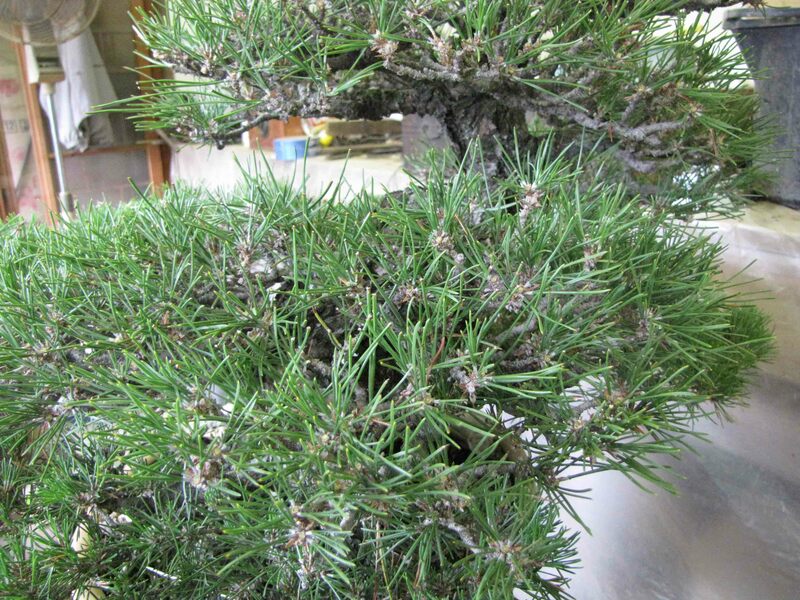 For new and seasoned Bonsai enthusiast, the concept of de-candling can be or still be confusing and misunderstood. Black/Red Pines in general are more difficult to work on because of balancing issues and one of the most difficult trees to balance. In this post, I’m going to talk about the concept of de-candling, when it’s applied, the results and the other details surrounding the concept. I will also talk a bit about cutting back and thinning of the tree as well. Of course, I’ll be sharing some pictures of the process. This is by no means the definitive guide to de-candling which is normally best taught by a trained and skilled instructor besides you, but this will give you an idea of what it’s all about. What is De-candling, Some Terms and How it Works? 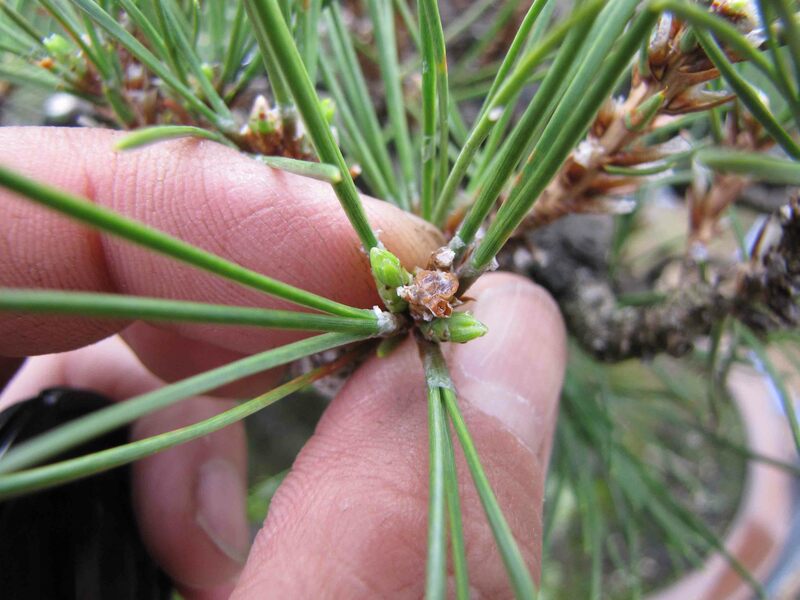 De-candling is the removal of new growth on Black/Red Pines during the Summer. De-candling is a very stressful process for the tree so be sure to only de-candle trees that healthy and growing well. Think about it for a second, we’re going to be removing all new growths from the tree. Most trees don’t like that! 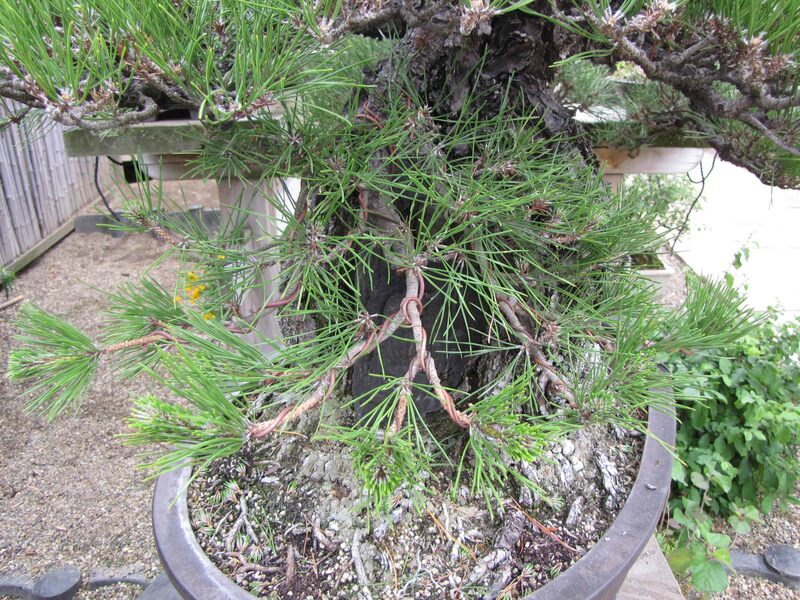 :op It just turns out that Black/Red pines are able to respond to that process and survive. 1. Branch Division – new buds will appear and grow at the base of the cut creating a division in the branch structure. 2. Short internodes and Shorter needles – since the candle is cut in the middle of Summer, the new candles that grow will only have the rest of the Summer and Fall to grow. 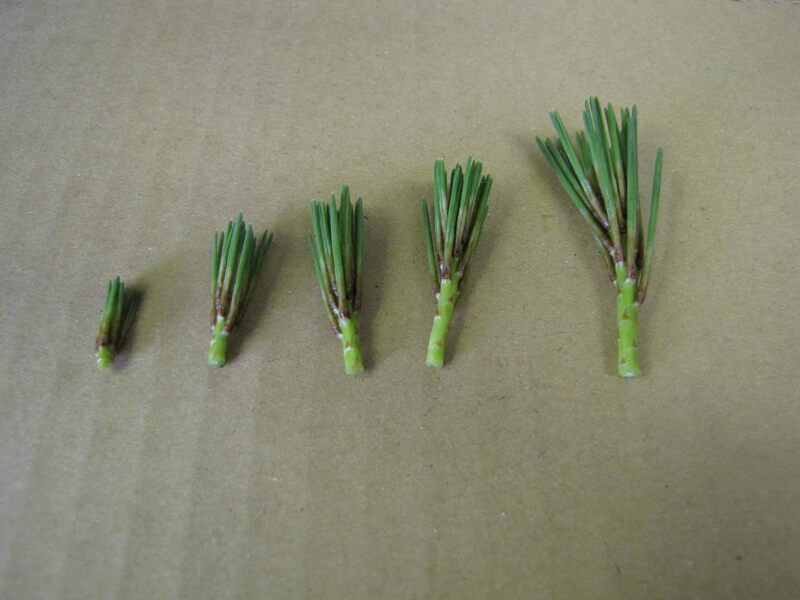 The growing season is essitenally cut in half, the new candles will have a shorter season for growing, resulting in shorter internodes and needles. 3. Back-budding – by removing the candles and putting stress on the tree, the tree will produce buds at the cut point and along the branches as well to recover and survive. 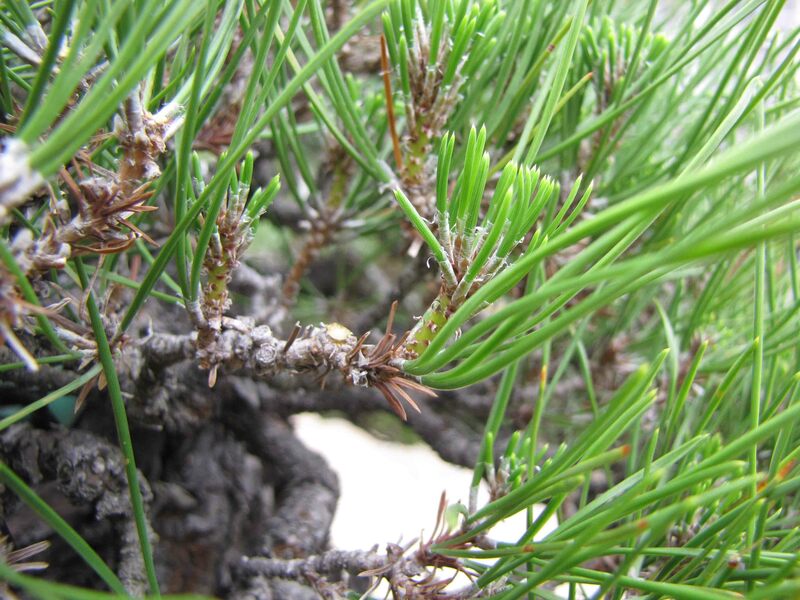 On Black/Red pines, branches that are older than 4-5 years old tend not back bud as easily. If there is bark on the branch, it will almost never bud in that area. Spring candles – New growth at the start of the Spring season. Summer candles – New candles that grow during the Summer and Fall because of the De-candling process. Four new Spring candles growing in a strong area. Most areas grow just one candle. Here is the same area with all the Spring candles cut off. It is important to cut off all the candles because it will force the tree to produce new buds. If we only cut the big center candle off and left the others, they would continue to grow instead and will not give us the desired results of de-candling. At this point, we’re now left with last years Spring candle/needles (this old candle was not de-candled last year). Since last years Spring needles are still producing lots of food for the area, we have to reduce the strength so that the new Summer candles don’t grow too strong. What we did was pulled off most of last years Spring needles down to about 5 pairs. Normally, last years Spring needles would have been pulled during the last Winter or early Spring of this year. Since we didn’t get to it then, we’re doing it now. Ideally though, the best time to pull needles is early Spring of this year. Here is a pictures of a branch that was de-candled about four weeks ago. Notice the two Summer candle buds starting to grow from the base of the cut. Here’s another candles that was cut during the same time but producing three buds. Depending on the strength of the area, we can get 1 new bud or as many as 4+. About three weeks ago, I was tasked to de-candle this Root over Rock Black Pine. It’s pretty big and heavy so I just did the work outside. Working outside isn’t too bad because it was a cool June day and I had company! Did you know that June in Japan is considered the rainy season? The high temps are around 21-27 C (70-80 F). Many times it’s cloudy. When de-candling, we start at the top of the tree so that gravity can aid us in our work. Last years Summer needles have been pulled already on this tree. On this branch, there are two candles that need to be cut. Sometimes a secondary candle can be very small. It’s important to cut these candles as well. Sometimes the secondary candle can only have one needle sticking out of it. It’s important to get those too. First I cut the small secondary candle. Next I cut off the main center candle. I performed this task on the rest of the tree using sharp scissors. While we’re de-candling, if we find branches that needs to be cut back, we can go ahead and do those cuts as well. Here is an example of a strong branch growing on top of a weaker branch. If left this way, the top branch will continue to get stronger whereas the bottom branch will continue to get weaker. Since this tree is well-developed and we don’t need the length or the strength of the strong branch, this is a good time to cut. Here is the area with the strong branch cut off. Now the smaller branch will have room to grow well and fill in the area. This sort of cutting is mainly used to maintain the shape of a tree. On this tree, there is a lower branch that was weak and allowed to run. Now the branches are nice and strong. I decided to put some wire on the main branches just to fan all the new growth out and give the smaller interior branches more room to grow and develop. I quickly applied some wires to the main branches. I did not de-candle this area so that it can continue to get stronger. Once the interior branches develop more over this year and next, the terminal ends that are really strong will be cut back to smaller branches. 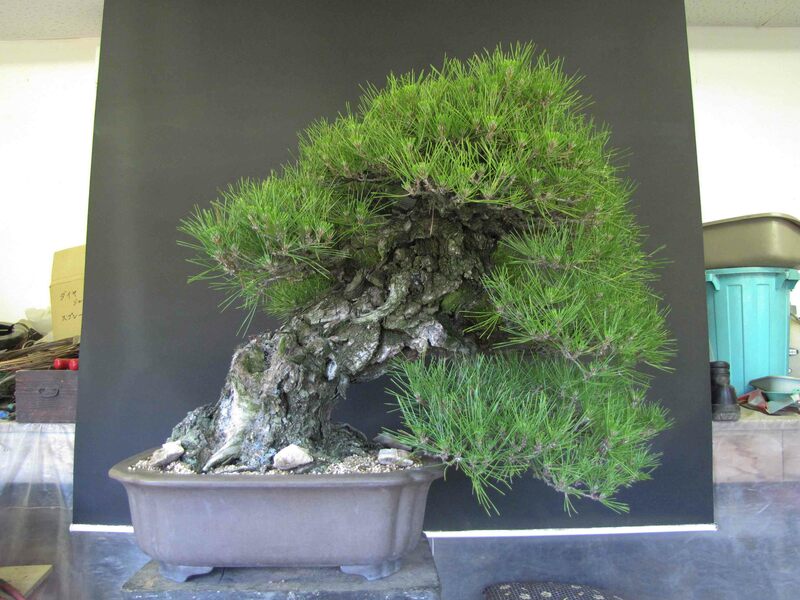 Assuming that the tree is healthy, wiring can be done on a Black/Red pine after de-candling. Heavy bending can be done as well but more care has to be taken not to twist branches too much because the cambium layer can separated from the heartwood easily during the growing season. Wiring can be very stressful to the tree as well. When an entire tree is wired (strong, medium and weak areas) the tree tends to take the stress well. If only certain areas are wired, this can cause a lot of imbalance with the tree, especially if the wired areas are weak. Since weak areas are under a lot of stress whereas the strong areas are not, this could more times than not, cause the weak wired branch to die off. Trees always want to get bigger and grow stronger. If the tree finds that the strong areas are growing well and the weak areas are under stress all the time, the tree will cut off flow to the weak areas and dedicate its energy to the strong areas instead. In this case, the entire tree was de-candled causing stress overall, and the weaker lower branch that was wired was not de-candled so the stress is limited. By keeping the work (stress) on the tree more balanced, the overall tree will grow more even. Often times, when working on any tree, there will be a weak branch that I want to positioned in a sunny area. Mr. Tanaka would tell me that if I only wired that branch, there is a 50/50 chance it will die, whereas the chance of living increases, if the entire tree was wired. Sometimes people will tie a rope to those branches to move them instead to create less stress. Here is the tree after the de-candling and some light cut back. De-candling isn’t an all or nothing process. Depending on the tree and the varying degree of strengths, some areas may be de-candled and other not. In this photo, you can see on the right is a branch that was de-candled. You can even see a small green bud starting to appear at the base. On the left side of the picture (interior of the tree) you can see the candles still intact. 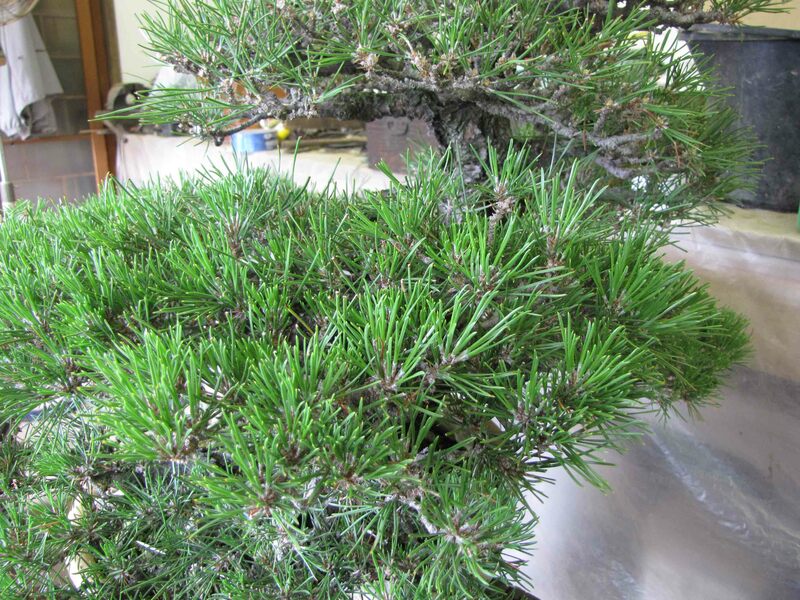 Many times when de-candling a Black/Red Pine, we don’t always de-candle everything. Areas that are too weak will be untouched to allow them to get stronger whereas the stronger areas get de-candled. By doing this, we allow the weak areas to get stronger and the strong areas to get weaker resulting in a tree that is growing more balanced from branch to branch. I’m sure there is about a million of these photos out there, but I’ll give it a shot. Here are some example of different strength candles on the same tree. Judging the strength of the tree is very much relative to itself. A tree with small Spring candles, relative to the tree next to it doesn’t always mean it’s weak. For example, if you’re working on a tree and every branch pad has strong candles (candle on the right of the photo) except for one branch pad that has weaker small candles (candle on the left of the photo), what should you do? In that case, the weak pad should not be de-candled because relative to the rest of the tree, it is very weak. If the whole tree has medium size candles all over, then it’s safe to de-candle everything. Of course, there is a point where small candles on the entire tree just means the whole tree is weak and should not be de-candled at all. De-candling is pretty straight forward right? Well not exactly. Remember when I said that Black Pines are one of the most difficult trees to balance? De-candling can play a huge part in that. Depending on the individual bonsai professional, different techniques of de-candling can vary greatly. All of them will have their reasons for their methods and many times the different techniques yield the same results anyways! Sometimes it just comes down to personal taste and preference. I’ve even come up with my own preferred way to de-candle as well! 1. 10-10-10 method – de-candle the weak candles first, 10 days later the medium candles, then 10 days later, the stronger candles. This method is used with the idea that cutting the weaker areas first, will give the new buds an advantage in time to catch up with the stronger areas before they start to push new growth. 2. 10-10-10 Plus method (I coined that term myself because I don’t know of a name for it) – The technique is the same as 10-10-10 method, except when de-candling the weak candles, the professional will go and pull off the new needles from the new Spring candle in the strong areas as well. So now you have a tree where the weak candles are cut, the medium candles are intact with needles and the strong candles are intact but with no needles. 10 days later the medium candles are cut and 10 days after that, the strong needle-less candles are cut. Not so much as a different method as the first, but a modified version. The idea behind this technique is to greatly reduce the strength of the strong candles. 3. Peg or Neck method – depending on the strength of the candle, part of the candle internode is left and acts a fuse to when the buds at the base of the candle will form. The stronger the area, the longer the internode (peg/neck) is left on. The idea behind this method is that the weak areas have no neck and will start to develop buds first, whereas the strong areas that have necks will need to dry up first before it start to produce buds, giving the weaker areas a head start. 4. Needle reduction method – Every candle is de-candle all the way to the base of the candle. Then based on strength of the area, old needles will be reduced to a certain count. The strong areas may only have 5 pairs of old needles whereas the weak areas will have 9 pairs of needles. The idea behind this method is that by reducing or providing food (needles) in an area will weaken or strengthen the new Summer candles to achieve balance. 5. Combination method – methods 3 and 4 are combined, usually because the tree is so imbalanced that one method alone won’t do the job. Thinning a tree can be a very complex procedure. There are so many variables involved in understanding which branch to keep and which branch to cut. Variables such as branch strength, length, and size are some examples. Learning to thin a tree or cut back a tree is not something that is easily learned by reading a book or even reading this blog! Haha! 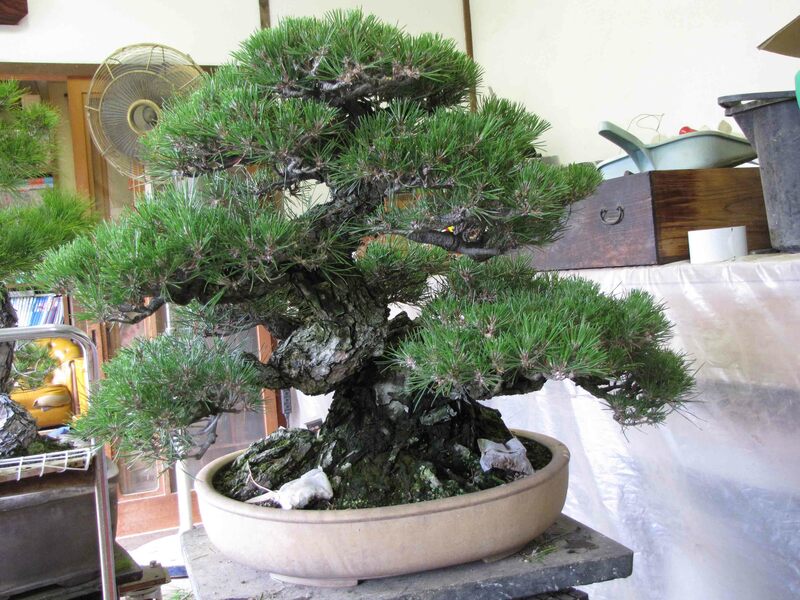 This skill is learned through deeper understanding of bonsai, experience working on trees that need thinning and is usually best taught by an instructor (Lets be real, skill is usually learned best through an instructor). So instead of trying to teach the concept of thinning and all its variables, I will provide some examples just so you can get an idea of what it’s all about. After de-candling for many years, there is a point where the tree becomes too dense. As there are more and more branches, the food gets divided more and more to the point where the tree could become week because there isn’t enough food to feed every branch well. At that point, the tree needs to be thinned. Thinned out meaning, removing branches (you know, the branches we worked so hard in growing!). Here is an example of a younger Black Pine that is getting too dense. Here is the same pad after de-candling. Still pretty dense huh? Since the branches are de-candled, we can expect the area to get even denser once the Summer candles start to grow. Here is the same pad after I thinned it out. Now more sunlight gets in and there is room for the Summer candles to grow. Here is an example of what I do when I’m thinning. Imagine this branch within a crowded branch pad. Which to cut? We need to make room somewhere. Sometimes I will de-candle the branches to get a better view of the situation. Here is the branch after I cut two of the four branches. Note how both branches left are about equal in strength (balance) and spread apart with nice spacing in between. Many times we always hear about how we want to reduce buds down to two. Once Pines develop enough branches, it turns out that the desired count is only one. One bud for one branch. At first, the process of thinning is slow and difficult, but with more experience, thought and variables just zip through your mind and you’re cutting away! So When Should I De-candle? Depending on your weather pattern and tree size, de-candling times will vary. While you’re thinking about the answer, here is a shot of Mark, a visiting apprentice from Australia with a very large Red Pine. Answer? Large ones first! Reason is because we need the large trees to have longer needles so we have to give them a longer growing season for the needles to grow, hence, de-candling them earlier in the Summer. Usually small trees are de-candled towards the end of the de-candling period. In Japan, De-candling normally starts at the end of June for large trees and ends at the end of July for small trees. Japan has a fairly long and humid Summer and Fall season. By December, the new Summer candles will have fully grown with short needles and have hardened off. In the California Bay Area,where the growing season is longer but less humid, the de-candling process starts at the beginning of June and ends at the beginning of July for small trees. That gives you an idea of how humid is a big player in how well trees grow. So thinking about what your weather is like in your area to figure out when you should de-candle your trees. If you’re not sure, start a little earlier such as the beginning of June or late May and see how the tree responds. If the Summer candles needles grow too long this year, next year when de-candling adjust your timeframe forward by a week or two. If the Summer candles and needles are too short, then adjust next year’s timeframe back a week or two. After two to three seasons of de-candling, you should be able to get a pretty good idea of when is the best time for you. Is My Tree Ready or Can Handle De-candling? Since de-candling is stressful to the tree, it’s important to understand that only strong healthy trees that have been more developed should be de-candled. Here is a tree that is ready for de-candling. The trunk and main branch structures are finished and it’s all about ramification at this point. Also, the strength of the current strong candles shows us that the tree can handle the stress of de-candling. Here’s a tree that is on the weaker side. Note how the tree is sparse and the Spring candles are small. This tree will not be de-candled this year. Next year when the tree is stronger, we can then go ahead with the de-candling. The biggest reason why weak trees should not be de-candled is because weak trees will not respond to it well. Instead of producing Summer candles, the tree will either produce only small buds that will sit till next year to grow, or the branches will do nothing and start to die off. This tree was also repotted this year so it’s already gone through a good amount of stress. 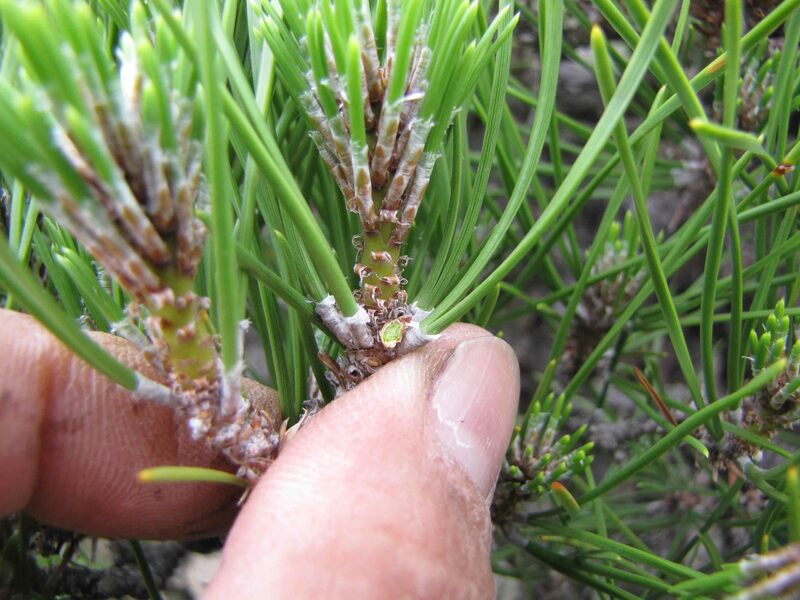 Fertilizing is very important when De-candling Black/Red Pines. Fertilizing should start at the beginning of the Spring season. We want to feed the tree well to make them nice and strong before we de-candle the tree. After de-candling, all fertilizers are removed and even the top soil is scrapped off and replaced. Fertilizing should stop for about 4-5 weeks after de-candling, then resumed moderately once the new Summer candles start to grow. If we started to feed the tree heavy after the 4-5 week break, we run the risk of the new Summer candles growing just as big as the Spring candles, defeating the purpose of de-candling. If we continue feeding heavily right after de-candling, the roots could potentially burn because the tree can’t take that much food anymore and the soil becomes too toxic with nutrients. This is the same as if we were to dump a bunch of food on the soil after freshly repotting a tree. Here’s a Black Pine at a customer’s house that I was tasked to de-candle. Before I started, I was told that this tree might be submitted into the next Kokufu-ten show! How cool! Of course, now the pressure is on. Haha! Here’s the tree after de-candling and light cut back. Once the tree fills back up again with Summer candles, it should look nice and full again. 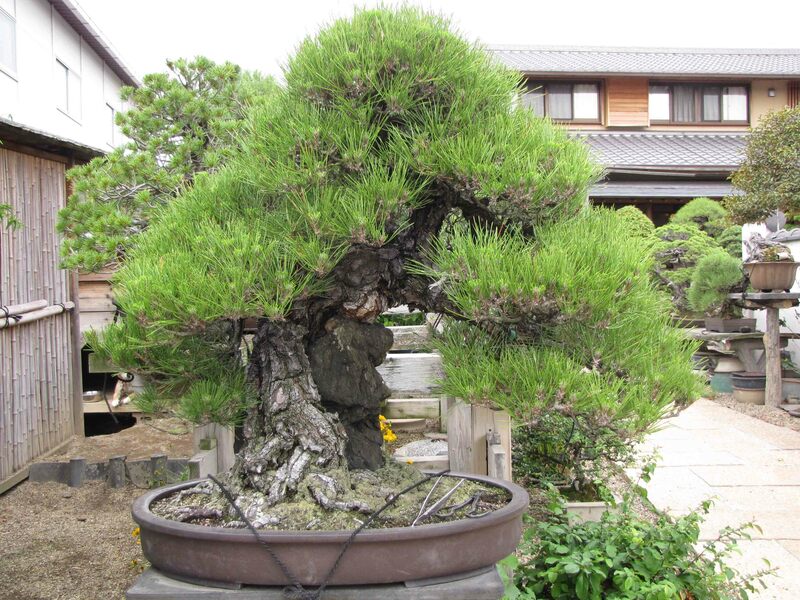 If the customer really does decided to put this tree into Kokufu, the tree would then be cleaned up, branches adjusted, lightly thinned for evenness and repotted into a more suitable pot. Well, that’s about all I have to say about de-candling at this point in time. I hope that this information gives you more insight to the process and why it’s done. Black/Red Pines are so fascinating to me because of its beauty and complexity. Balancing them is like a mystery that needs solving and it turns out that the answers are mysteries in themselves! I’ve said this before and I still say again today, if a person can balance Black/Red pines, that person can balance any tree. Soon I will be posting some trees that I’ve worked on as well as more information about ceramics that I promised in the past. Stay tuned because I have lots of information and photos just for you! Currently, there is 713 people subscribed to the blog! That is incredible and more than I’ve ever imagined! When I first started this blog and told Mr. Tanaka I got my first 100 subscribers, he would jokingly says, a 1000 would be better. Well, at this rate, it seems like its only a matter of time! Thank you to all the supporters, subscribers and readers of the blog! I hope you’ve enjoyed all the post and I’ll keep them coming! Take care and try to stay cool this Summer! Your ears should have been burning Sat as we had a workshop with John and we talked about how wonderful your posts are. Hope to see you in Sept. when you are home. Hi Peter! Great job on de-candling info. Just one question. 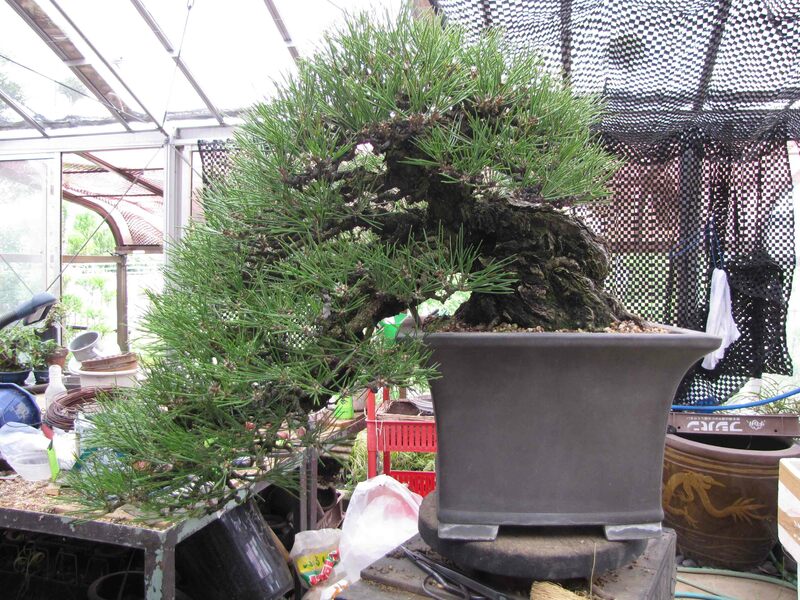 In the picture of the ROR Japanese Black Pine with the dog in the background, I noticed what looks like a turntable underneath the stand. Is this for rotation of the tree or ease of working on the tree, both? I am always on the look out for cheap turntables to put under my trees for rotation. I also have a 4H Bonsai youth group and the lazy-Susans come in handy for the kids to work on their trees. ing to write you in regard to the large trident maple post, as I’ve been working on a couple similar trees. I haven’t had enough time to sit down and put it together with pictures. Hopefully, sooner than later. Great article Peter it helped clarify the decandling process further. I can’t wait for you to get back to the Bay Area, so I can be one of your first students! Love the blog! This and the previous Maple entry got me to sign up. Have you done any entries on Larch? Thanks for reading the blog! No past post on Larch. 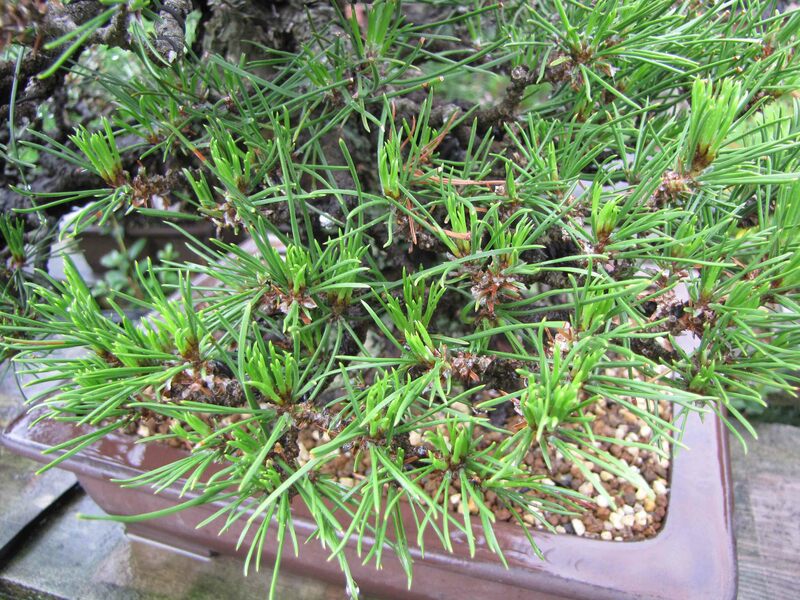 So far, I haven’t seen any Larches in Japanese Bonsai so not sure if I’ll have much info on them in the future. I’ll ask Mr. Tanaka and see what he has to say about them. Thanks again! I am a new subscriber and have enjoyed reading about pine de-candleing. Keep your posts coming. The detailed photos that go along with your narrative really helps to visualize the concepts. 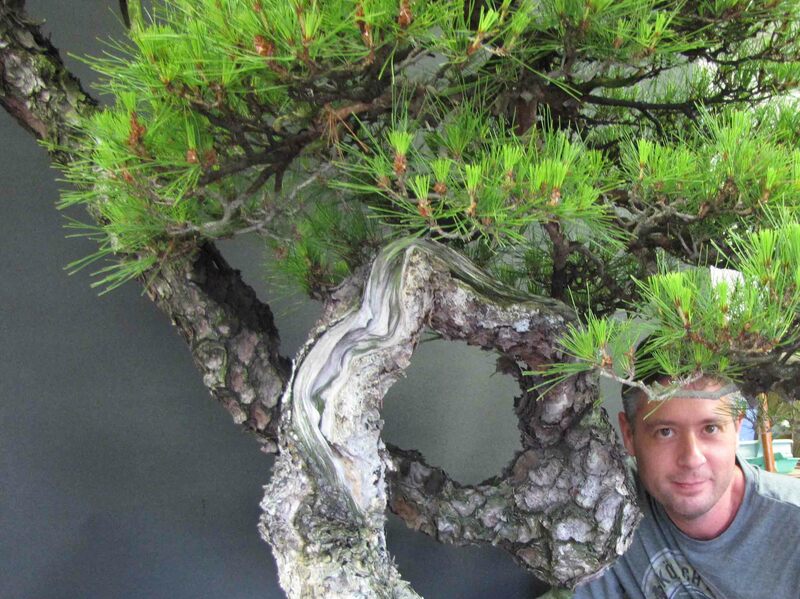 You know someone loves bonsai when they spend 6 hours on a rare day off writing about Bonsai! Either that or I’m going crazy! LOL. Thanks Sam! Peter, in Brazil (and here, in Minas Gerais state) the seasons are not very defined: by now, we are in the “winter”, and temperatures are about 18-21C. So, conifers do not behave as they do in their natural environment. However, I can see the black-pine (I have a little one, started from seed in 1968) sprouts better at the summer (november). I started to think about de-candling, but I´m not sure about when, and how to prepair the tree before to do it. Can you tell me anything (or add some thing to your excellent post above) to think about it? thanks. If you have a young tree and you’re growing the main branches for thickness, the branch itself will back bud on it’s own. Young branches that are allowed to run will normally start to produce back buds without any cutting. When you get those back buds, take care of them and foster their growth (Give them space and sunlight to grow). You can de-candle them if they are strong to get a divide in the branch structure whereas the long terminal end is still allowed to run to continue the thickening of the main branch. Once the branch is thick enough, the terminal end would be cut and you will develop the branch pad with those back buds that you’ve been developing. If you have a new candle growing from the trunk that you want to make into a main branch, it is okay to de-candle and then allows the two new candles to run and gain thickness. The only problem is that the process in creating that main branch with thickness and a foliage pad will actually take you longer to develop. Once that new candle is cut and two candles are allow to run, though you have two branches, they will not thicken as fast as allowing one candle to run and it back budding on it’s own to creating your future branch structure. I hope that all makes sense Larry. Thanks for the very good questions! great info as usual. when multiple summer buds appear at what point do you reduce to one or two buds or candles? assuming that it is a healthy tree. The best time to reduce the new Summer candles down to two or one is after November. By that time, the new Summer needles have hardened off. Your window to do that is pretty much during the Winter months. During the Summer, just allow everything to grow out. Thanks for the question Donald. Take care! 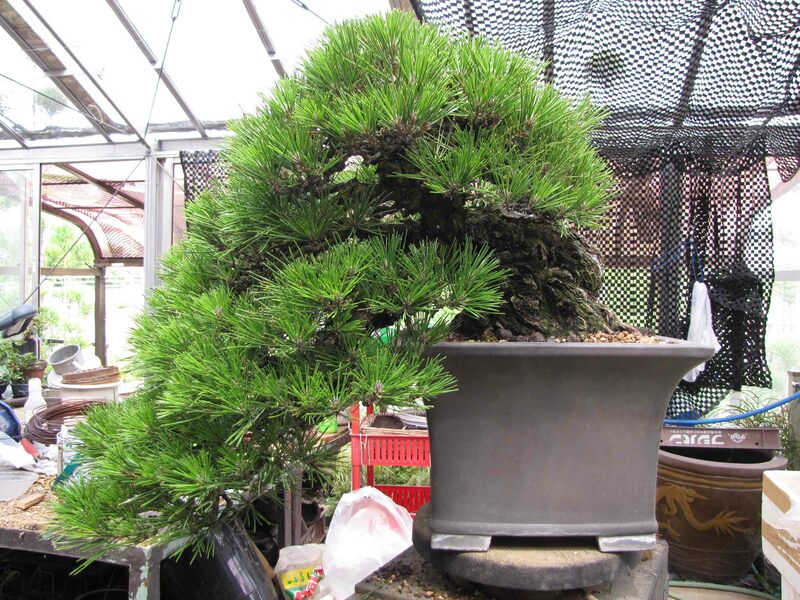 Normally when Black Pines are repotted, they are not de-candled that year. Since the repotting stresses the tree, the new candles should be growing very slowly and small. If the tree is growing well after the repotting and the new candles are very strong, then it’s okay to go ahead and de-candle the tree. Sometimes, some areas are growing slow whereas other areas may be really strong. In this case, you would de-candle only that strong area and leave the rest alone. Perhaps the whole tree is slow but for some reason, one branch is growing really strong. In that case, it’s not out of the question to just cut that one candle to slow it down. At the end it all comes down to a case by case evaluation of the tree. If it’s strong, then it can take more stress. If it’s weak, don’t do any work and let it grow out and recover. In the Fall when everything has hardened off, you can do some light pruning to maintain some of the shape. Thanks for the questions Ryan! Take care! This is the clearest explanation of the process of de-candling that I’ve read so far. The many illustrations with appropriate photographs makes understanding so much easier. Any tips on the culture of the various yatsubusa cultivars? We don’t de-candle the yasabusas that we have because the needles are normally pretty short. Many times, if the yasabusas are de-candled, then will explode with even more candles! Haha! For them, we allow them to grow out during the year and prune to the branches we need in the late Fall. Of course, if there are some out of control runners during the year, you can slow them down by just breaking the strong center candle. In the Fall, you would then cut it off and keep the smaller candles. Thanks for the questions Seiji! Take care and say Hi to Della for me! Peter, informative piece. I have known of the 10-10-10 approach from others. I just cannot resolve the logic of this approach with my experiences of managing branch growth. If I want to strengthen and thicken up a weak branch, I will let it grow and conversely if I want to slow down a strong branch I will cut it. In the 10-10-10 approach, the weakest is cut first and strongest last. Help me to resolve this conflict in my mind. Thanks for the question and comments. You are correct that not de-candling weak candles and allowing them to grow helps strengthen the area. The 10-10-10 technique refers to weak candles as the small healthy candles (mostly candles growing on the lower branches). For example, if the lower half of the tree have smaller candles then the top of the tree, de-candling the bottom healthy small candles will immediately force them to produce new Summer candles. The reason why the strong candles are removed later is that the bottom branches get a head start in growing Summer candles. If the top is strong and the bottom is weak and everything is de-candled evenly, of course, the top would grow new Summer candles first and the lower areas would come in second. Energy balance never occurs and you still have a weak bottom and a strong top. By giving the bottom a head start in growing new Summer candles, they have a chance to catch up with the top so that the tree becomes more balanced. By cutting the top later (giving it less time to grow summer candles), the top is weakened to help match the bottom. This will give you a much more balanced tree from top to bottom. I hope that makes sense and clarifies things CJ. Thanks Peter. I have finally figure out and thus resolve this conflict in my mind. I think it got to do with the weather. Here in Perth, my trees grow year round while in most part of Japan they take a break in winter. The cutting induce them to wake up to grow new shoots. Do old candle grow bigger and longer in Japan ? Thanks Peter, for another great post! I realy enjoy reading them and am allways looking out for the next post. I had a question though. a few posts you wrote about the repotting of a very large JBP. A big yamadori with all its current branches grafted on. is it possible for you to show us more about the development of this tree? Thanks for the comment! As the large tree is being developed, I will take some pictures of the things we do. Recently, the customer called us and says they want to sell it so I’m not sure how much work we’re going to do with it. If we do end up doing something to it, I’ll have my camera ready to take some shots. Thanks for the wonderful and informative post! Great explanation Peter!!!! My experience closely matches your techniques. 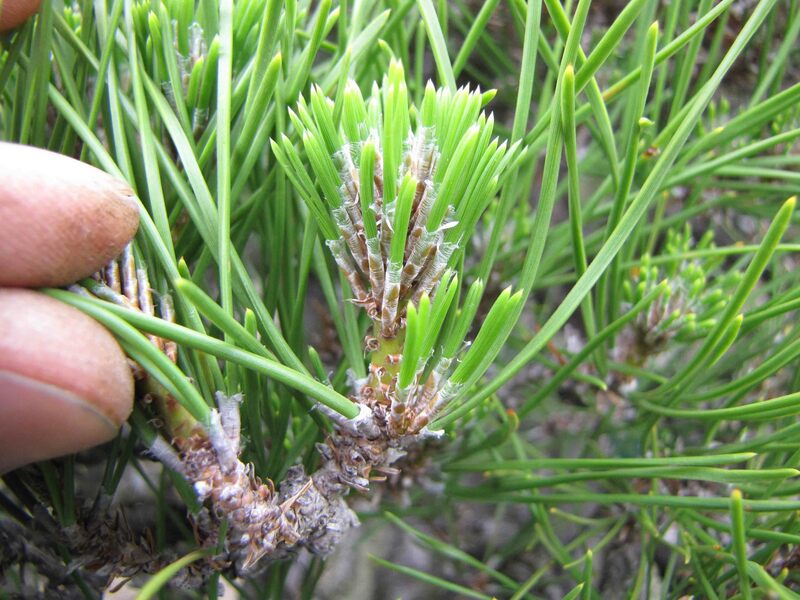 as for the Scots question from D/D, even though they are two needle pines, other needle reduction techniques are very effective with Scots and are much less threatening to the health of the tree. So glad I had a chance to see de-candeling in more depth before taking a pine into my group of plants. My early plants were all tropicals, then the adventure into flowering indoor/outdoor. 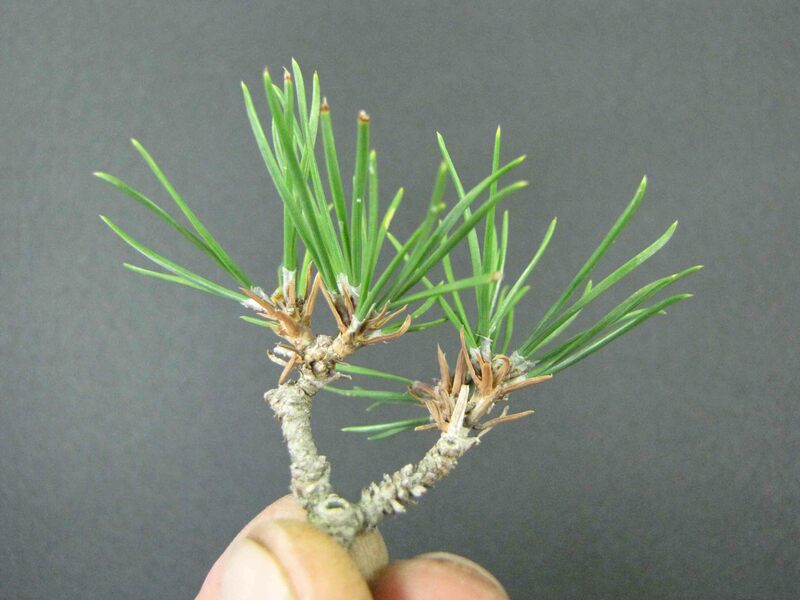 as I’m still learning the deciduous newbies to the fold,and have lost a Mugo pine through ignorance, maybe if I keep re-reading this blog entry in particular, next year may see a shohin Black Pine or two joining the group. I really appreciate the number and quality of your photos. What kind of camera are you using? Thanks for the kind words Muriel! I hope you do add a Black Pine to your collection in the future! They are both challenging and rewarding! The camera I’m using is a inexpensive Cannon PowerShot SX10IS. I bought it about 3-4 years ago. I’m thinking of making an upgrade soon but this camera seems to be able to take a lot of my abuse. LOL! Thanks again Muriel and take care! Thank you for you wonderfully photographed and detailed description of the de-candling and branch strengthening. I had not considered both restricting and encouraging branch a weak branch at the time of de-candling. Another thing to think about as I evaluated the health of my pines and their future development. When do you ever find the time to do it all? Thanks for the kind words Michael and take care! I feel like I should join the group and just say thanks for the great job………..but, I will assume you know that already. Now…..back to the subject of decandling weak branches in the 10-10-10 System. 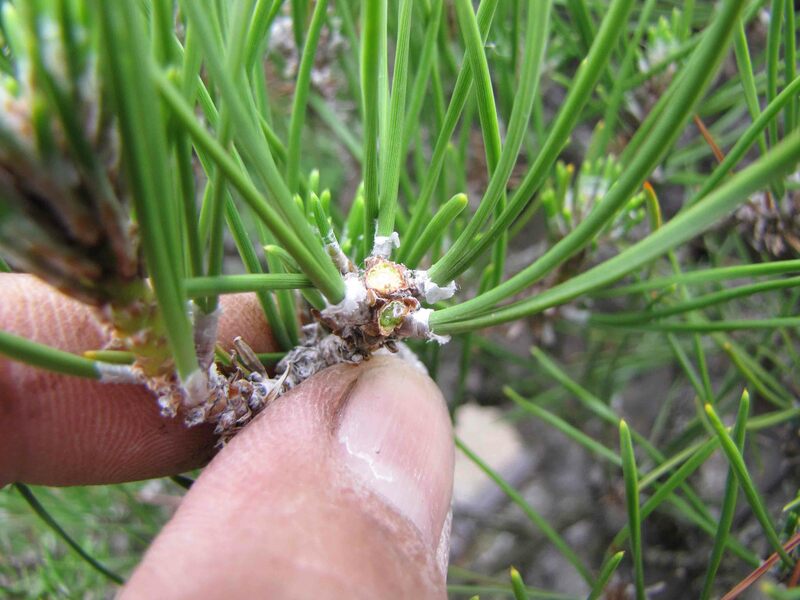 Every written word in the English language about 2 Needle Pine Development says………Never Decandle Weak Branches at the risk of losing the branch. In fact, most, if not all of these same sources go to great lengths to specify “Pinching” candles by 1/4 or 1/2 or 1/3 or 3/4 you get the idea, many approaches….based on numerous factors, but never [well rarely] cutting off the entire candle. 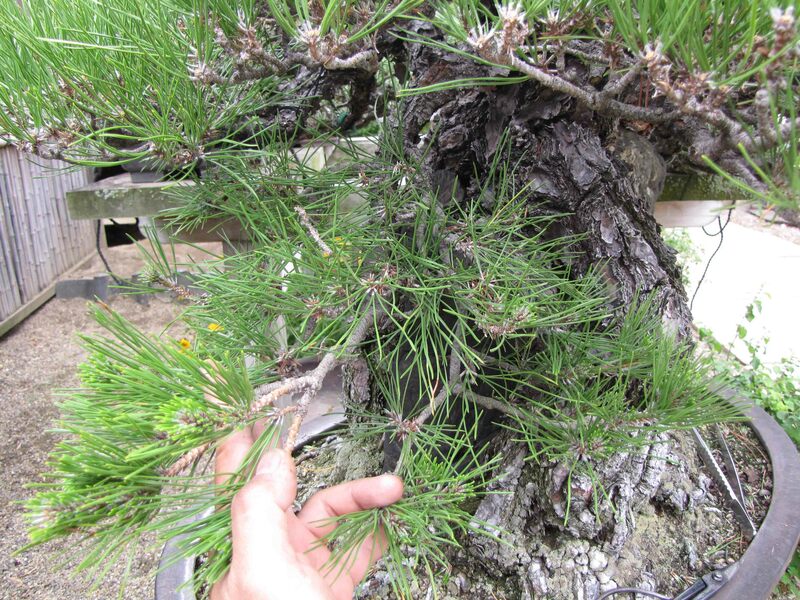 My Novice question is: Are your practices unique to Japanese Black and Red Pines and do not apply to trees such as Scots Pines…….common as Bonsai in Europe and the US? 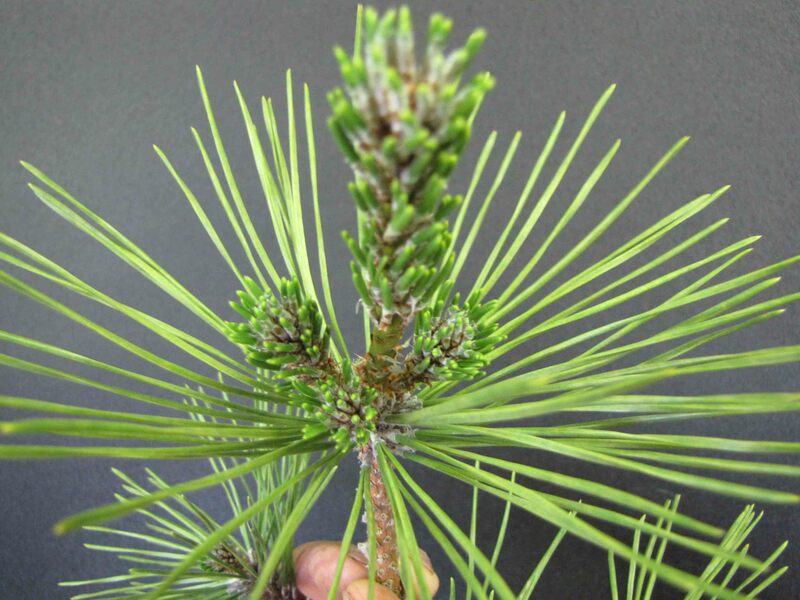 After all, its a 2 Needle Pine? When I refer to weak candles, I mean small healthy candles. I probably should have used a better word then weak. Many times, there are really tiny candles on the interior of the tree. If they look too weak for cutting, then they should be left alone. If the candle is small in relation to the largest candle but is pretty strong in itself, then those are the weak candles that I’m referring too and should be cut. I’ll try and do my best to explain this concept in a future post. Thanks for the question as usual Daniel! Take care! Hi again Daniel, I realized that I didn’t answer all your questions. 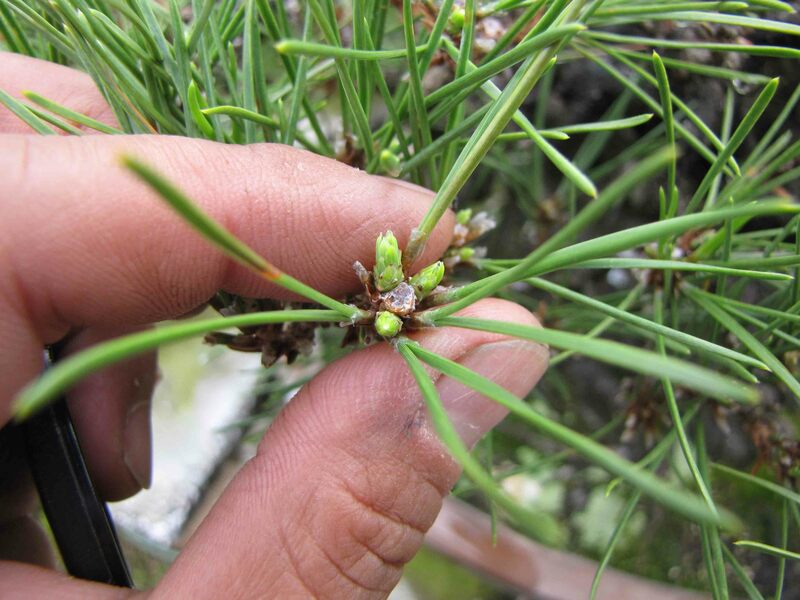 As for the 1/2 or 1/4 pinching stuff, that’s a technique is for high mountain pines such as scott pines and five needles pines. 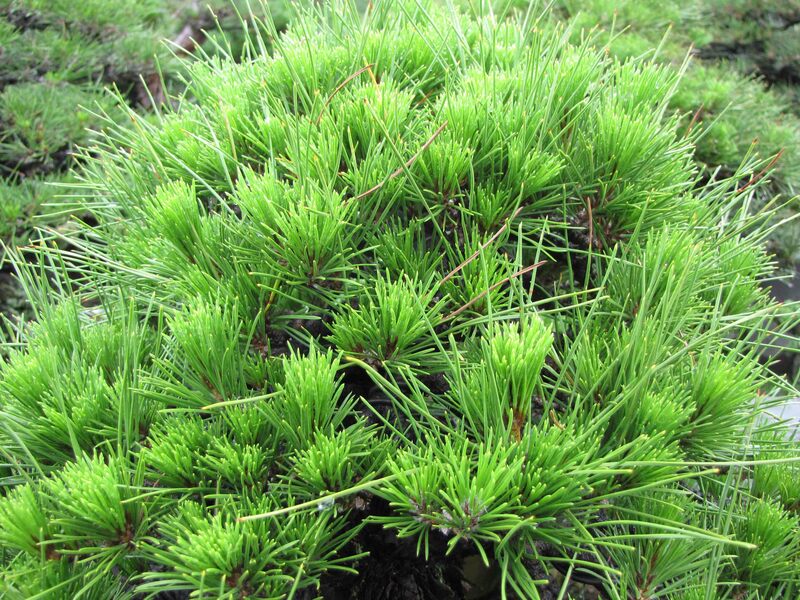 Just because a pine has two needles doesn’t mean it will take well to de-candling. 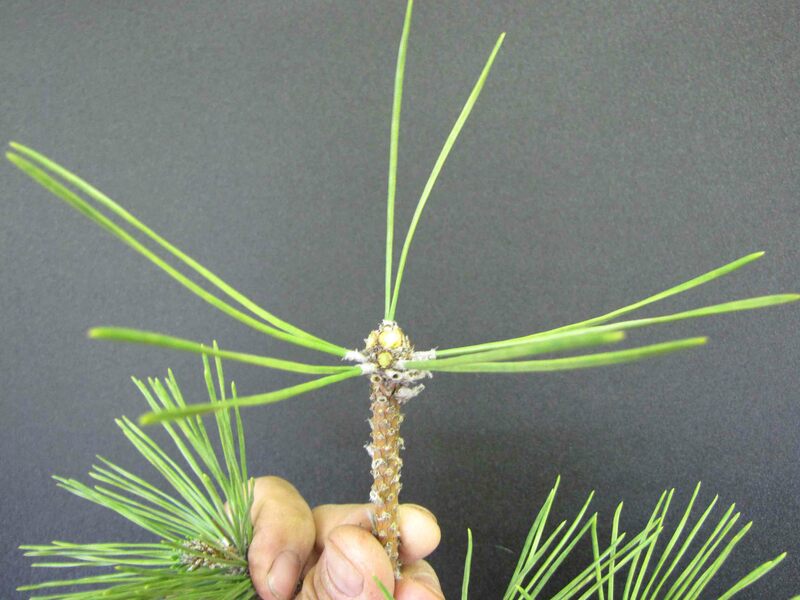 In the past, that technique was used for Black pines to control the growth as well, but that technique couldn’t control the needle lengths. 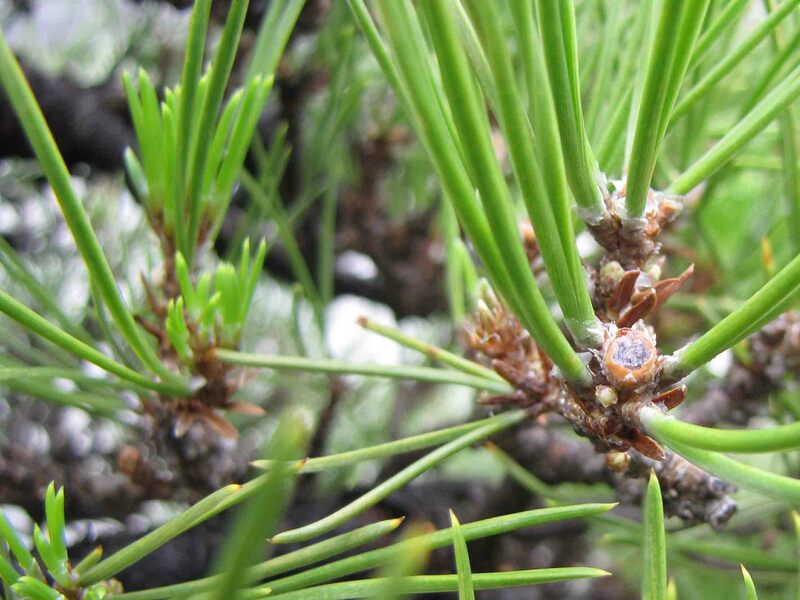 At one point, people discovered that if you cut the candle off on Black Pines, they will grow secondary candles that are shorter with shorter needles. Since it worked so well, everybody started to do it and it’s a common technique today. 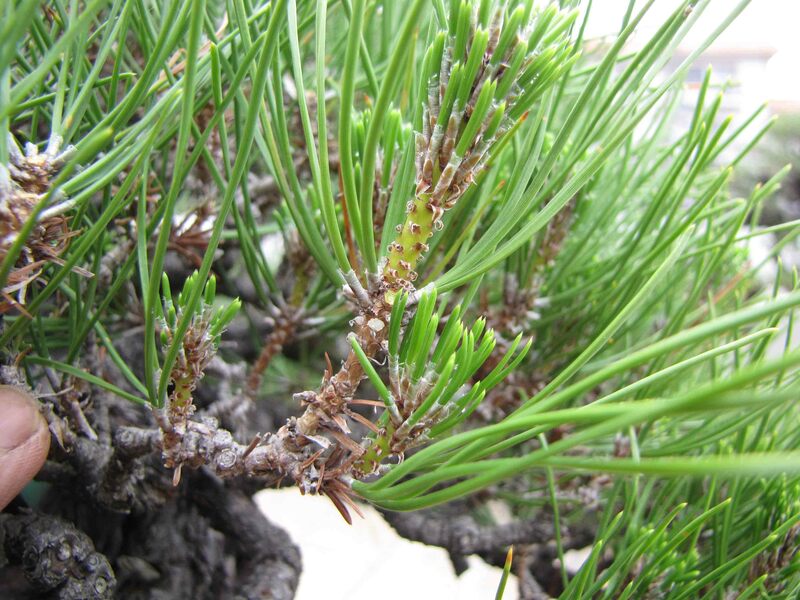 You can still use the pinching technique on black pines but the results won’t be a good as de-candling. I probably should have stated that the de-candling technique is pretty much limited to only Black Pines and Red Pines. Really appreciate your thorough continuation of the answer you provided to my question. I am almost starting to get it. 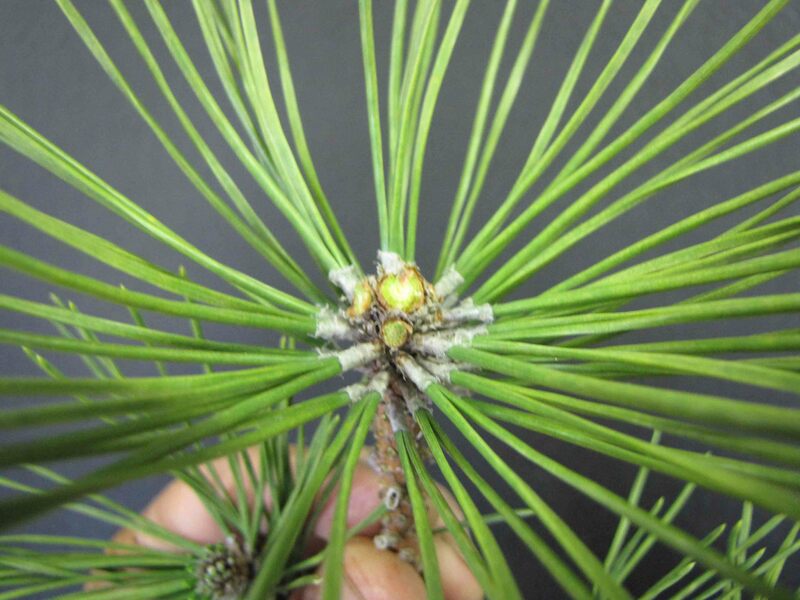 Now that we are all up to date on Black and Red Pines…….when are we going to get into the really difficult material……..White Pines? Hi Peter…you are such a good teacher….the best. I look forward to you blog and check every day for some new pearl of wisdom. Thank you. I thought I understood pine de-candling pretty well but I was wrong…again. Keep teaching me I really like that. Do you have a yearly schedule written out by weeks? I could use that. I’m trying to create one from your blog. Wonderful as always…thanks. That’s a great idea and I should put some kind of calendar about when to do certain things on trees. 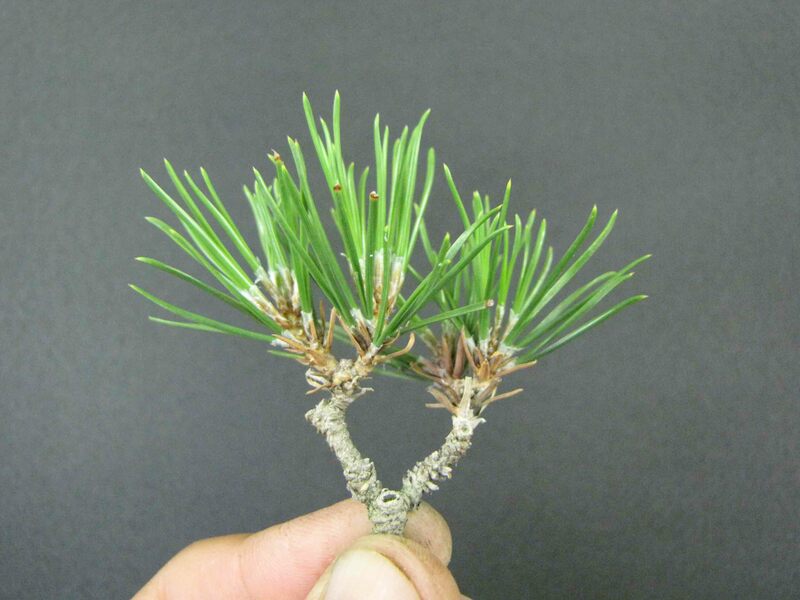 For black pines, it can be fairly simples. Summer (June or so) – de-candling if the tree needs it at that point. If de-candled, the tree can be wired at this time as well. Fall (about November) – pull old needles and thin out new Summer candles produced from de-candling down to one or two candles. Tree can be wired at this time as well. Winter – Good time to wire as long as you can protect the tree from freeze. I’ll cover more of the specifics in future post Barbara but I hope this helps in the mean time. The months stated above are more for california and should be adjusted if your climate is different. Great info Peter as usual! But I’m wondering, what about trees in the early development? Where you’re still growing out for trunk thickness, growing out branches for thickness and length to scale for instance, growing for height…..do you just use candle selection of spring candles to direct the growth in the direction you want? I’m wanting to avoid a pin wheel branch, but add the girth on the trunk and branches? You are absolutely correct in what you’re doing. When growing black pines for trunk thickness or even branch thickness, all you need to do is selectively prune the tree for direction. Trees at that point are not normally de-candled until the trunk and some of the main branches are at their desired thickness. Once the thickness is achieved, then de-candling is a great way to develop more branch ramification. Thanks Chris and take care! Wow, thank you for the time you put into this article. The information was very well written and the pictures were extremely helpful. Perhaps we can see the same trees in fall, when you work on them. Great article Peter. I’ve taken numerous classes with Dennis Makishima and never had a better understanding of de-candling. Hope your timeline Japan so far has been rewarding and enjoyable. My time here as both seen it’s high and lows, but I wouldn’t trade it for anything! I’ve learned so much and the experience is great! I can’t wait to get back home and share more info with everybody! Thanks and take care Ed! Great Info. Thank you for posting the detailed information on de-candling. I really appreciate all the extra picture. I just started last night de- candling my black pines. Would I also do this with my Austrian pine at this time of year? 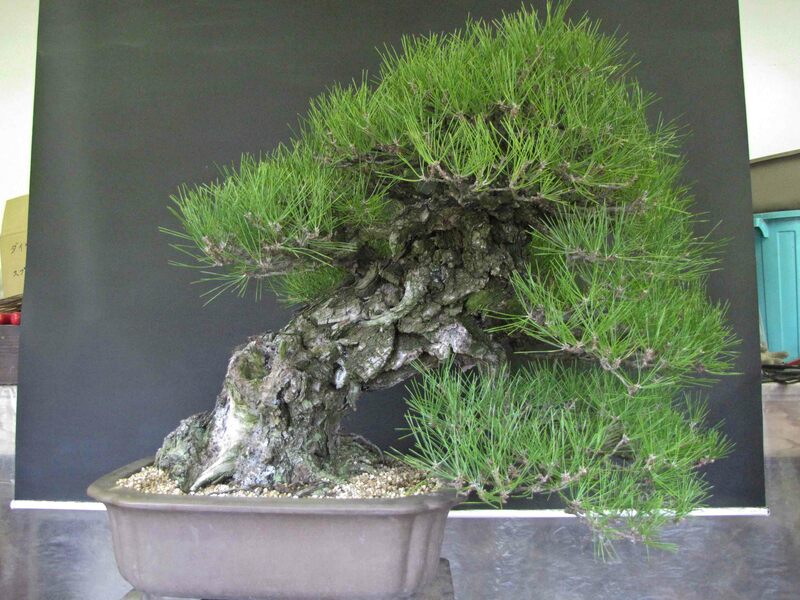 Austrian black pines don’t respond to de-candling very well. They tend not to grow new candles after the de-candling process. Work on Austrian Black Pine should be more like White pines where you pinch the candles during the Spring growing season to control length. 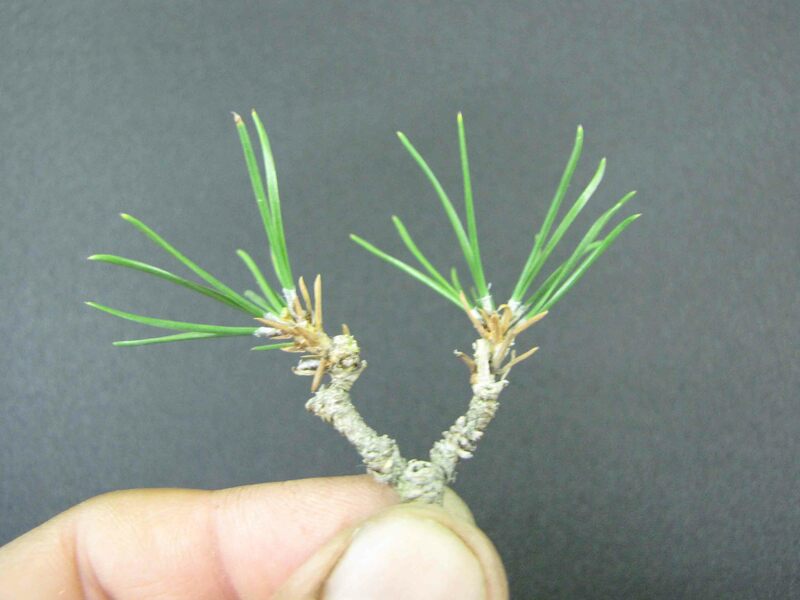 In the future, when I talk more about White pine development, you can apply those same techniques to your austrian black pine. Thanks for reading the blog Maria and take care! Peter, This is the best article/post I’ve seen on candles and pines. Thank you! This article is just great. As always, very well explained and documented in great especially. As always, a lot of useful tips. Many thanks for sharing your knowledge. 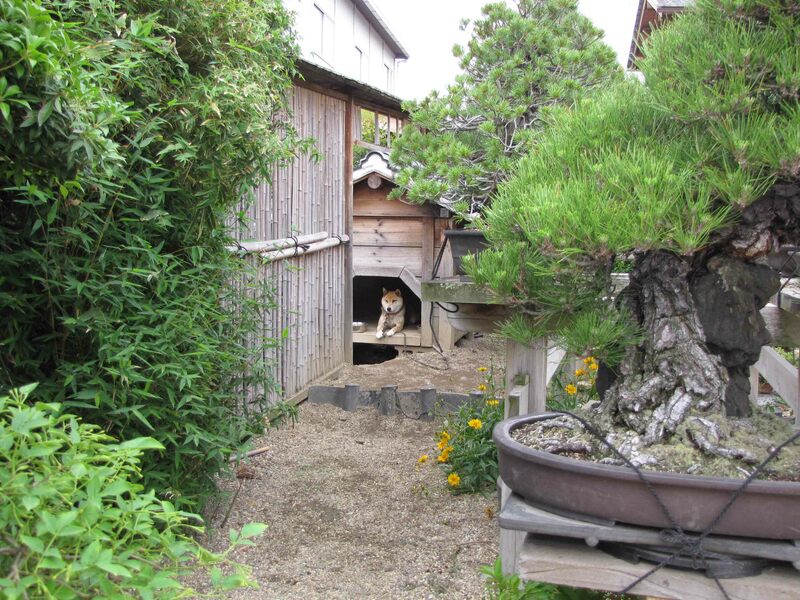 If I read here so I do still have a long way to go with my work on bonsai and my blog. The best stuff i ever read about bonsai Peter. Always with a big smile on my face :-). Have a nice hot summer over there. 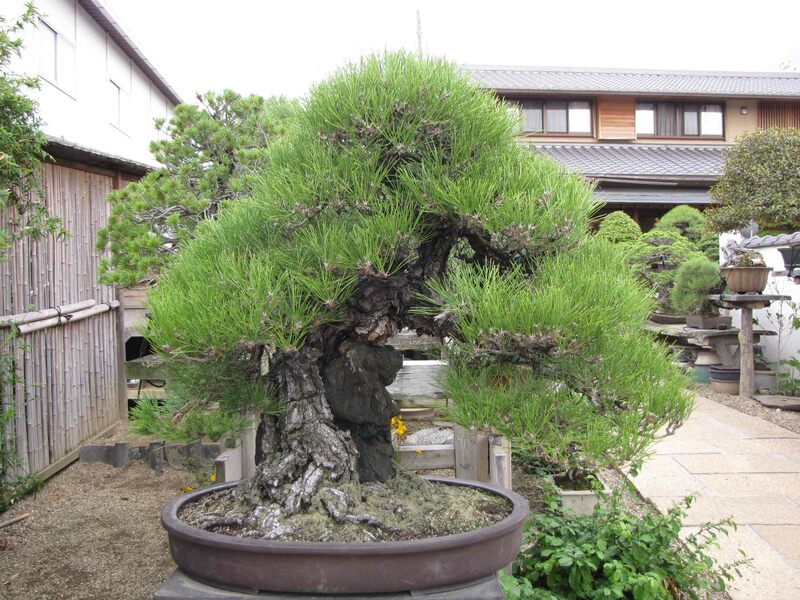 Tx for this great piece of education about a very important part of bonsai.